Anyone with a strong vested interested in Batman v Superman: Dawn of Justice and the DCEU world it sets up has probably heard the recent rumors that Warner Bros. is nervous about the release. Test screenings have not gone well, and some predict a financial disaster for the studio. Some even believe it will lead to Justice League Part 1 being delayed, derailed, or canceled all together. The biggest rumor is that Warner Bros. wants to can director Zack Snyder. Guess what? None of that is true. In fact, this morning, Warner Bros. and DC Comics has officially confirmed that Justice League Part 1 will start shooting this spring. Justice League Part 1 will begin production on April 11, two weeks after Batman v Superman: Dawn of Justice hits theaters this March. Even if this epic superhero kickstarter doesn't quite meet expectations, it doesn't sound like Warner Bros. is ready to throw in the towel just yet on Zack Snyder. The director had this to say about recent cancelation rumors. "The idea that we could begin to boot up a Justice League concept was a cool thing. It was a little bit of an 'about time' moment, and I don't blame [the studio] for feeling that way, because it's a long time coming. But I do feel like it's a little bit of a creative hurdle. It seems like an easy thing to do at first glance, the idea that, 'Oh, we just get the rest of the superheroes in there.' But you have to [establish] a world where they can exist." Running at 151 minutes, the first half of Batman v Superman: Dawn of Justice focuses on the big brawl between these two DC icons who have never shared the big screen together. The second half of the movie will help establish the famed Justice League team, with an extended cameo from Wonder Woman and brief appearances from Aquaman, Cyborg and The Flash. It is also rumored that Green Lantern may make a quick appearance. Ben Affleck has created a new take on the Batman persona, with an aged vigilante who hates the Man of Steel for all the destruction he's caused in Metropolis. The Justice League cameos, while fleeting, will help lay the ground work for what we'll see in Justice League Part 1, which will arrive in time for the winter holidays in 2017. Zack Snyder is currently in the UK, prepping for the spring start date on this mammoth undertaking. Mad Max: Fury Road director George Miller came very close to getting his own version of the DC superhero team in theaters back in 2007, a failed movie that is chronicled in the upcoming documentary Miller's Justice League Mortal. All the main cast members were in place, and shooting was on the cusp of actually happening. But the Writers Guild strike of 2007 collapsed the project. Since that time, the script and concept art has leaked, giving fans an idea about what this may have looked like. Wonder Woman is currently shooting, and will get her first-ever standalone movie next summer. That movie has long been stuck in development as well, dating all the way back to 2005, when Marvel's The Avengers director Joss Whedon was developing a story he planned to both write and direct. It never happened. Now, Patty Jenkins is directing with Batman v Superman: Dawn of Justice star Gal Gadot taking the lead as Diana Prince. It will arrive in theaters just a few months before Justice League Part 1 makes its decades long-awaited big screen bow. Justice League Part 1 is shooting at Leavesden studios in southeast England, and will utilize on-location shoots in London and Iceland. 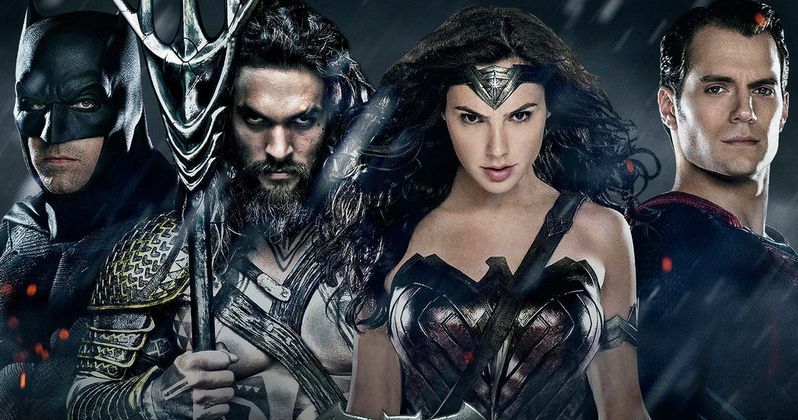 Contrary to believe, Justice League Part 2 will not shoot back-to-back with Part 1. But it is staying put on the DCEU release schedule for 2019. It will arrive after solo movies for The Flash and Aquaman in 2018. These movies will be followed by Cyborg, starring Ray Fisher, in 2020 and Green Lantern Corps., which doesn't have any actors attached yet. There is also a rumored Untitled Batman Reboot that will allegedly debut sometime before 2020, to be co-written and directed by Ben Affleck, but that has never been confirmed by Warner Bros. and DC. Also on DC's massive slate is Shazam!, starring Dwayne Johnson as Black Adam. While the actor has said that the movie ties into the DCEU, and earlier teased a match-up between Superman and Black Adam, the movie is housed at Warner Bros.' sister studio New Line, and does not fall directly under the WB DCEU banner. While there was a three year gap between Man of Steel and Batman v Superman: Dawn of Justice, there will never be a stretch of time like that between DC projects again. Says Zack Snyder. "The studio really wants us to try and pace it up, as far as -now we have an idea where we're going"
The gap between the two DC movies is attributed to the creative teams needing to thoroughly map out the various standalone movies and the overall arc of this interconnected story. We'll get our first taste of what's in store when Batman v Superman: Dawn of Justice finally hits movies this March. What do you think? Is DC and Warner Bros. just trying to cover for faulty hardware? Or will this operation be able to sustain itself as a viable machine on par with Marvel? Sound off in the comments sections below.